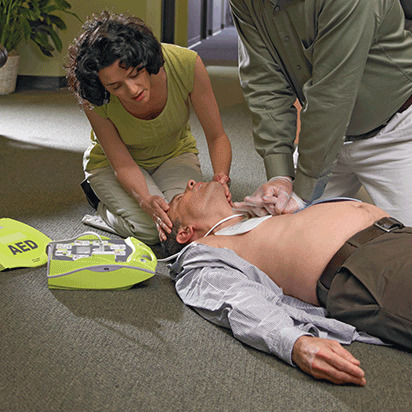 The Adult, Child and Baby First Aid/CPR/AED Online course will prepare you to recognize and care for a variety of first aid, breathing and cardiac emergencies involving adults, children and infants. The course features award-winning simulation learning â€“ an interactive experience where you will respond to real-world emergencies in a virtual setting. The course must be taken on a Flash-enabled PC (it cannot be taken on a tablet) with a high speed Internet connection. Allow approximately 2 hours 45 minutesto complete the course. This course does not meet OSHA requirements for workplace certification. This kit includes 2 CPR masks — one adult patients and one for children, and one that is specially sized for infants. This latex-free CPR mask is designed for use on infants and features a soft, malleable cuff to form an effective seal. Stay ready to help at a moment's notice. The Mini CPR Keychain delivers everything you need to perform CPR in an easy-to-carry package. Minimum Order Quantity—5 units. Wear your support for our life-saving mission and humanitarian efforts with this classic Red Cross T-Shirt. Adult, Child and Baby First Aid/CPR/AED Online is rated 4.1 out of 5 by 7. Rated 5 out of 5 by cseebs84 from Great online program to learn the basics! Very happy I found this online course. Very informative and useful to do on my own time to complete. Would definitely recommend! Rated 5 out of 5 by Jessica4 from Great Features I brought this a month ago and was very pleased with it. Rated 5 out of 5 by Online 212 from Great features! Very educational & convenient to do on your own computer. The repetition in the modules was very helpful for me. I learn better being able to see things. Rated 5 out of 5 by Al DOD from Easy to navigate I found the course to be easy to navigate and quite user friendly. It allows you to learn and test your knowledge on the way to re-certification. Rated 3 out of 5 by maryhj from CPR This is not the first time i've taken a CPR class. However, it is the first time i've done it online. I much prefer the live with people and not the online. IT also took a bit to figure out how to navigate the class. Multiple times I thought I had completed a section only to have more pop up. Rated 5 out of 5 by Bubbly22 from Great class! I really enjoyed the scenarios and practice. It surprised me how much I learned!